The HAMILTON-G5 is Hamilton Medical's most modular high-end mechanical ventilator. A large set of standard features and options allow you to tailor the HAMILTON-G5 to your needs. The integrated cuff pressure controller IntelliCuff® continuously monitors and automatically adjusts cuffed tracheal and tracheostomy tubes, providing real-time optimization of cuff pressure. The Protective Ventilation (P/V) Tool provides a repeatable method to assess recruitability and find the best PEEP based on respiratory mechanics, as well as providing an easy and repeatable method for performing recruitment maneuvers. The HAMILTON-G5 also supports transpulmonary pressure measurement. 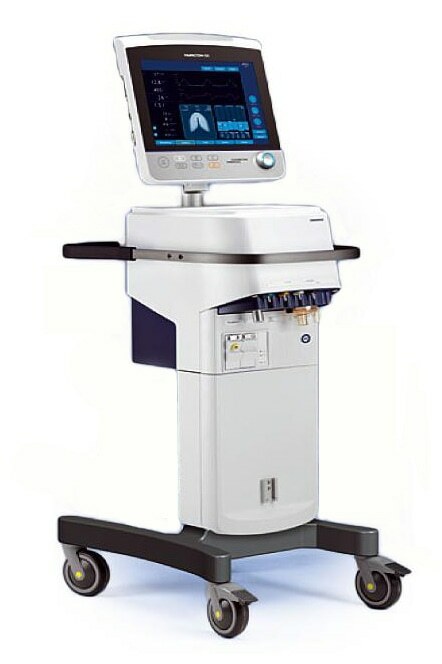 In addition to many other features, the HAMILTON-G5 also includes Hamilton Medical's standardized Ventilation Cockpit user interface and the intelligent ventilation mode, Adaptive Support Ventilation (ASV®).